SE-Test India Pvt. Ltd. is among the leading vibrating machine manufacturers in India and we supply to engineering and construction firms, universities and testing labs in India and abroad. Our vibrating machine has been designed as per the standard prototype that is accepted globally by the professionals in engineering verticals. Standards: IS 4031 1968, IS 1344 1959, BS 4550. Product Description: The apparatus is made from high quality base materials to ensure superior performance characteristics and precise measurements with least of errors. High grade steel 304 is used along with heavy duty motor to deliver top rated vibration functions. Cement Vibrating Machine includes a frame placed on coil springs and carries a cube mold along with a revolving shaft. There is a balance weight under the base plate that offers stability to the frame during operation. The center of gravity of the machine is kept either towards the eccentric shaft or within a range of 25 mm. 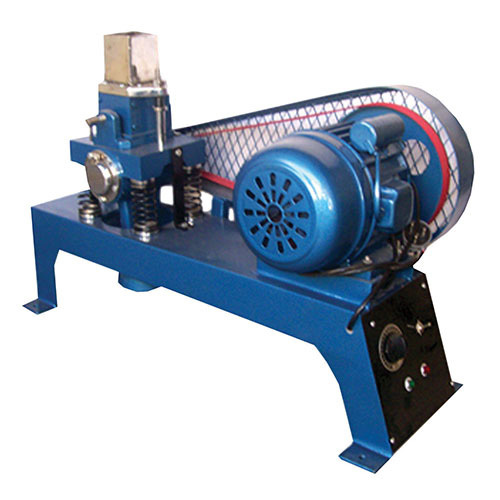 Specification:With design and quality on par with that of international manufacturers, SE-Test India has secured its place among the leading vibrating machine exporters in India. Complete apparatus is available including the different components like mortar cube, belt cover, balance weight, springs set, base plate and a digital timer device. The complete testing apparatus is tested for accuracy and stable performance before it is moved out of the production line at our manufacturing facility. Such quality considerations makes SE-Test India leading vibrating machine suppliers while we are also the among the top mortar cube vibrating machine manufacturers.